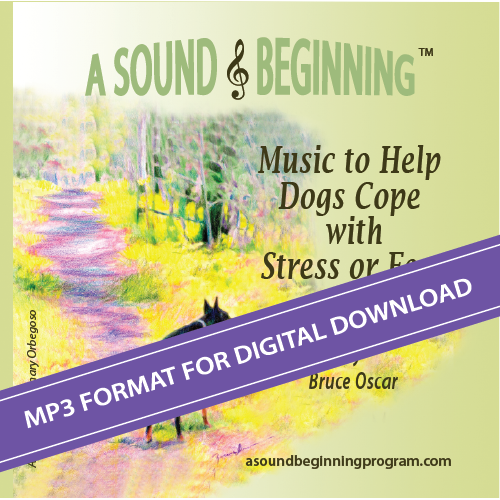 A Sound Beginning CD -- Now in Digital MP3 Format!!! Get it for only $5 with the purchase any other product in our store. Apply Coupon Code ADD1MP3 in shopping cart before checking out. 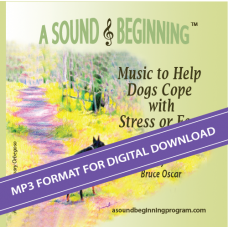 A sound therapy digital album of solo piano music created specifically to lower a dog’s anxiety by affecting the nervous system – lowering blood pressure and slowing down heart rate. Once your purchase payment is confirmed you will receive an email message with a link to your digital product. You may also click on My Account / Downloads from the ASB store menu to access your downloadable products at any time.